Clown Triggerfish "Balistoides conspicillum" is also known as the bigspotted triggerfish, are demersal marine fish belonging to the family Balistidae, or commonly called triggerfish. The clown triggerfish is a small sized fish which grows up to 50 cm. Its body has a stock appearance, oval shape and compressed laterally. The head is large and represents approximately one third of the body length. The mouth is small, terminal and has strong teeth. Quick Overview: Very colorful, and usually get very aggressive with age. 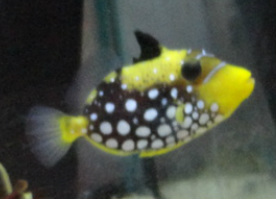 One of the most sought-after aquarium fish. Care: Fish only. Only 1 triggerfish per tank is usually recommended. Aggression at various ages: Mostly peaceful until juvenile/adult. Caution: They can become extremely aggressive at any time.